This recipe uses a 9-10 lb pork belly slab like those found at Costco, and cutting that in half to cure part now and the other part later. If you have a smaller pork belly, halve these ingredient amounts and go from there. Note that you need 2-gallon re-sealable plastic bags to hold the meat, and pink curing salt; neither is likely found in local grocery stores, but they are on Amazon. You cannot substitute other salts for the pink curing salt! The pink type is necessary for the curing process. Full preparation time on this includes about 9-10 days in the fridge: about 7 days to cure, and 2 days for it to dry, followed by the day of smoking. Cut the pork belly slab in half and rinse and pat dry both pieces. Place them in separate re-sealable 2-gallon plastic bags. Mix together the spice rub. It'll form a thick paste. Roughly divide it into quarters, and use a quarter on each side of a pork piece. The rub will be very lumpy. Don't worry about a perfect, even coating; the pork will release juices and the flavors will seep in during the curing process. Close both bags, pressing out as much air as possible. Freeze one bag for later; as a precaution against holes getting torn in the bag, wrap it well in plastic wrap, too. When ready to start the curing process for this half, add another day or two to the curing time in the fridge to account for thawing time. As for the ready piece of pork belly, set that bag in the fridge for the next 7 to 10 days, until it feels firm. Flip the meat once a day. Remove the pork belly from the bag. Rinse it well and pat it dry. Set it on a rack on a small cookie sheet in the fridge and let it dry for another two days. No need to flip it at this point. Set up your smoker at 200-degrees. Applewood chips are a great choice, but maple and hickory are fantastic as well. Smoke the pork belly for about 3 hours, until the bacon reaches an internal temperature of about 150-degrees. 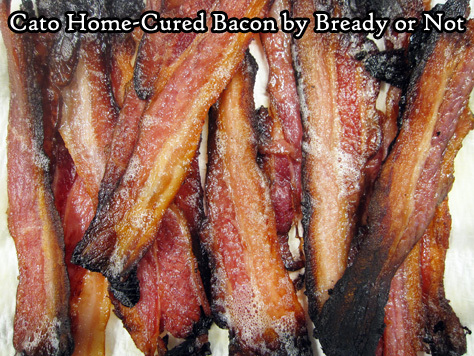 From this point, slice and cook the meat as you would regular bacon, but note that this fresher, homemade variety will cook much faster. Use plastic wrap or plastic bags to store the sliced meat in the fridge for upwards of a week, or freeze for up to 2 months.